The week is over and I am now qualified for the 200, 400, 800, 1500 and 5k races at the Senior Olympics in Roswell. I am happy the formalities are over, I feel pretty tired. I did not taper or cut any hard workouts prior to the 5k run. It was slow, but even. I just have to accept, for now, that my 5k times above 6500 ft are alway 2-2.5 minutes slower than sea level. That is a lot! After looking at my 400 time (1:24) and my mile time (6:58 while running easy-not racing but effortful) that speed is not an issue. I would be happy to run my 5k at 7:00 pace. At sea level my 5k is about 7:05 on hilly cross country courses. But on Saturday my pace was, 7:56, 8:04, 8:00 and 7:25 for the last .1. I could not run faster. My leg was acting up as well, my quad freezing up which hurts like mad, but it was all I had. Then today, Sunday, my new friend Michelle and I ran 8 miles. I thought, “oh this will be nice” but holy cow it was HARD. It was a 4 mile out and back, with 1,000 ft of elevation gain in the first 4 miles, plus it was super soft sand. I was dying. But here is the thing. My HR was low, 145, my breathing hardly noticeable, but I still had to have several walk breaks on the way up. I was so happy once we finished, it took 1:45 to run 8 miles! So what’s up? I consulted Heart Rate Training by Roy Benson (my former coach) and Declan Connolly and got an answer. page 35….”You go out for a run, you perceive the effort as pretty hard, you check your HR for validation expecting your HR to be high, but it is surprisingly low and your pace is slow.” Problem? Have not properly recovered from previous runs or worst, you are starting to become overtrained. Well I know my problem, not recovering properly = not eating. After racing on Saturday, then running some recovery miles I ate huevos ranchero, then never ate again that day. Running takes away my appetite and unless I plan and bring food to stuff in my mouth after a run, I may not eat for hours. This is a consistent problem that I often overlook, especially when I am trying to lower my body fat %. So my plan. I have 10 weeks before state games. 1. Always have a good variety of food in the house. 2. Take banana or other high quality carb with me to eat post run. 3. If I am too lazy to eat, get some Endurox R4, it is great recovery drink. 4. Two race pace workouts a week, intervals and stamina runs. And lastly to just have fun! 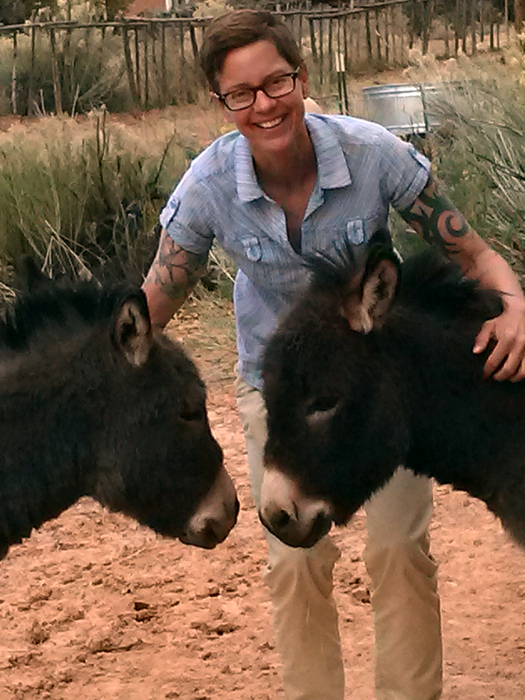 Today, post run, I had fun with my two new burro friends seen at the top. On Good Friday, Michelle and I will run to the El Santuario de Chimayo.El Santuario receives almost 300,000 visitors per year and has been called ” the most important Catholic pilgrimage center in the United States. During holy week the road is jammed packed with pilgrims, entire families will be making the walk from far away places. We will probably run about 10 miles not the 200, 300, 400 mile walks that the deeply devoted make. I have never been there during holy week and I am not religious, but I think it will be extraordinary. 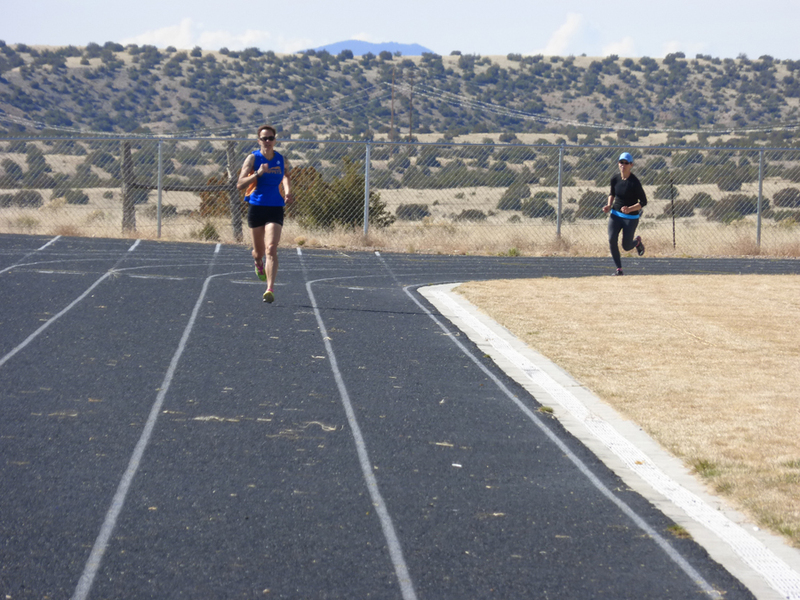 A month ago a friend was helping fund raise to send senior athletes from Taos country to the State Senior Olympic Games in Roswell. (yes the place of all the UFOs!). I donated artwork to help raise money for the qualified athletes get to the games. Two days later I came home to an official looking form held down by a rock at my front door. It was an entry into the Senior Olympics. Wooaaaahhhhh, Senior Olympics, you must have gotten the wrong house. Well my friends Senior Olympics start at age 50. Yes, 50, that scares and freaks the crap out of me. But two encounters about the games in a week from two very different people, hell, why not listen. There was a phone number on the paper, I called and talked to Carol, an extremely exuberant women (a friend of a friend of a friend) who said, “Hilary, you have to sign up immediately, the forms are due now drive it to the city office building today”, a 45 mile round trip. I did. I met he head of recreation for the county and he too was wildly enthusiastic. He said they have 2 workouts a week, the county fully supports the program. They will bus us to Roswell for the State Games and there was a meeting on Sunday about the regional qualifiers. Okay, I signed up for the 800, 1500, and 5k. I may do the 10k. 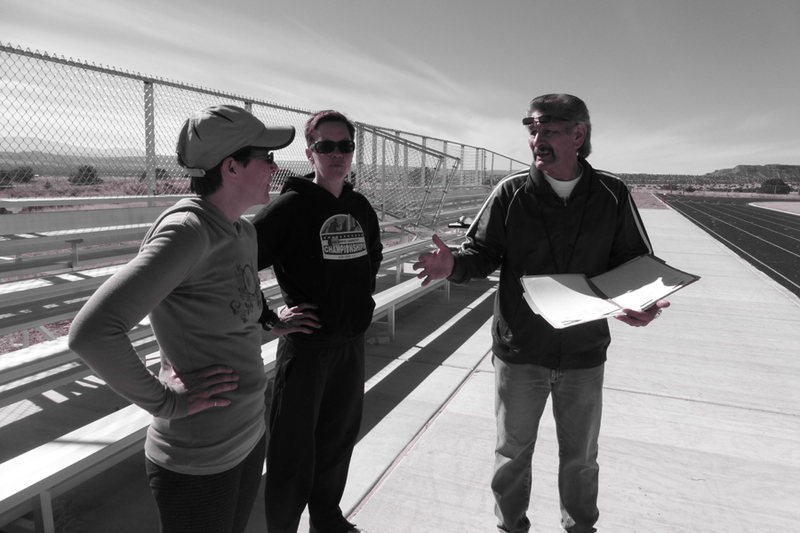 I have the opportunity to learn and practice a bunch of other stuff; shotput, javelin, airgun, high jump, long jump. But I would probably hurt myself and not be able to run. At Sunday’s meeting I met the other runners, it was all men. But they told me I must contact Michelle. She is one of their stars. She is 6 or 7 years older than me but ran a 44:51 10K in the 50-54 AG at State. My best 10k is 45:48. and that 44:51 is the state record. I feel a challenge coming on. ( it is still at a higher elevation race which will slow me down) I checked the National Records for the 5k. I have always wanted to run a fast 5k, but I have not done training specific for that. The National record is 18:55, I will never see that. But I can get to the top 10, the slowest is 21:20. National Games are not until 2017, qualify in 2016. I will also represent NM. After slogging around the last three months trying to make my long runs, it was not happening, and I am not running Boston this year. 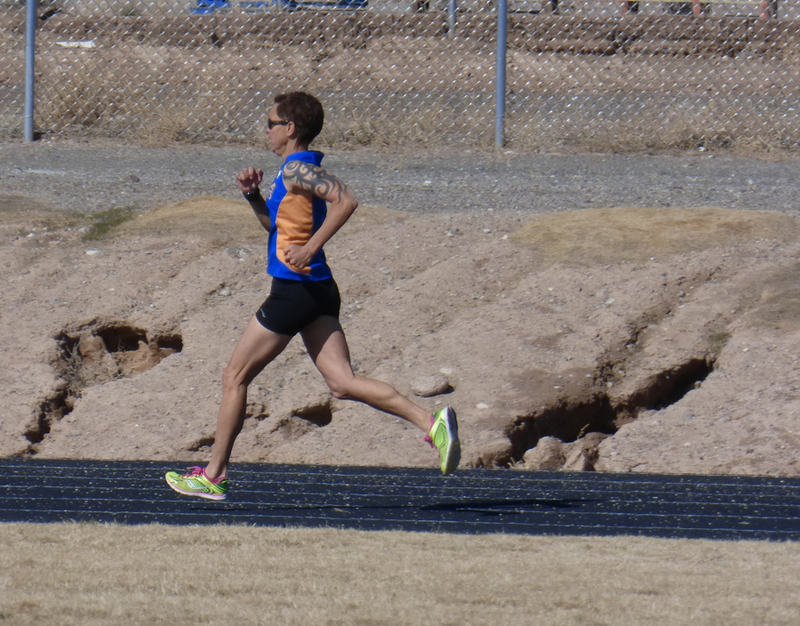 On Friday I got in my first track workout in over 8 months, 10 x 200 with 200 rest, Saturday 5 miles EZ, Saturday, Sunday 1.67 mile warm-up followed by 2:00 fast, 1:00 slow to very slow x 9. This was done on rolling, mostly uphill roads at 6200 ft. I woke up today, excited to do another run. I am excited to run again. I want to run short and fast. I want to race. Friday I am running with Michelle. We will coordinate our training for state. I want to see UFOs. Senior Olympics? Bring it on! My next chapter in life, compete for 50 freakin’ years! That is my next life goal. That is me on the left, I took great pride in beating the two lovely ladies with the really nice bellies on the right. They too could be at the senior Olympics! I want to feel that rush of running short and hard again. And I will. 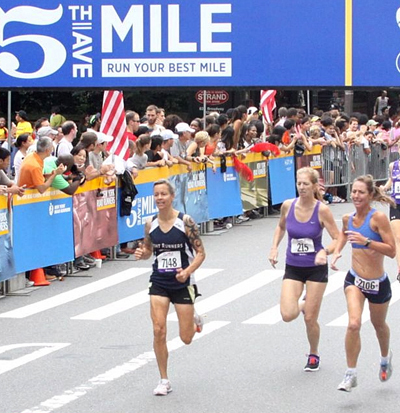 And I will be back in NYC for the 5th Avenue Mile 2015, sub 6:00.